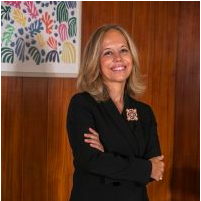 Isabel Capeloa Gil is the rector of Universidade Católica Portuguesa (UCP) for the period 2016-2020 and Full Professor of Culture Studies at the Faculty of Human Sciences. Professor Capeloa Gil studied in Lisbon (University of Lisbon), Munich (Ludwig-Maximilian University), Chicago, and holds a PhD in German Studies from UCP. Previously, she was Vice-Rector for Research and Internationalization (2012-2016) and the Dean of the Faculty of Human Sciences (2005-2012). Having grown up in Asia (Macao), Isabel Gil has a special interest in researching issues of diversity and conflict and has structured her work around the exploration of the disciplinary boundaries between literature, the arts and other disciplines. She was a founding member and is a senior researcher at the Research Centre for Communication and Culture (CECC), where she coordinated the research group Culture, Art and Citizenship (CULTCIT). Isabel Gil is furthermore Honorary Fellow at the IGRS, School of Advanced Studies, University of London and holds a position as Invited Professor at USJ (Macao). An advocate of strengthening doctoral education, she has been involved with the Council for Doctoral Education at the European University Association. Isabel Gil has held several visiting professorships in Germany (Saarbrücken, Munich, Hamburg), Ireland (National University of Ireland), Italy (Univ. Ca Foscari, Venice), Brazil (PUC-Rio de Janeiro) and in the US. She believes firmly that global engagement in higher education is key to advance stronger values for a more equitable world.